We had another fine day Saturday with temps in the mid 60s. I had hoped to get out sooner to but schedules got tight and I wasn't able to start riding until 4 PM. Still, it was nice enough to ride in shorts, although my arms were a different story. I headed over to Pequonnock River Valley, aka Trumbull, with the Qball for some Trail Ambassador-ing and also to prep for the up coming race at Hop Brook in two weeks. I figure some trail riding on the weekend and single speed commuting during the week will do the trick. 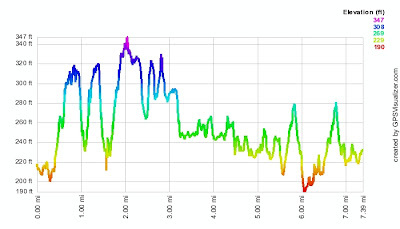 Actually took last week off from spinning and commuting because after spinning Friday, then riding Saturday and Sunday, and then spinning again on Monday my left knee started to hurt. I think that much activity was too much and I need alternate more. I think the hammer fest at Wilton Woods started it but the spin class on Monday was icing on the cake. Knee started to feel better on Friday and by Saturday it felt really strong. What can you say about Trumbull that's bad? Nothing. This place rocks and has something for everybody. It's basically a river valley with some really interesting geologic features. Supposedly there are caves and this area is often referred to as Indian Caves, but I have yet to see any. There are some really big cliffs of bare rock exposed on the east side of the valley that look like they were created by glacial movent. This also means there are beaucoup drops and rollers, one of which is the famous Green Monster. I started out at the Park Street Commuter Lot off of Daniels Farm Road and took the same route that I usually take which the white trail to the red trail split. Follow the red trail to where it meets up with the yellow trail. On this part of the ridge, the yellow and red trails crisscross each other numerous times and it's hard to keep track of them, however the red trail does try to stay on the outermost edge. Above is a picture of a typical branching of the yellow and red trails. I think I took this shot where the trails split off prior to the stream crossing (where they meet up again). Since I was out Trail Ambassador-ing, I had on my new CTNEMBA Trail Ambassador Jersey but didn't come across anyone who was lost, injured, or broken down. So it was a nice quite ride. To keep the riding alone theme I of course was riding with my RPGs. After the picnic tables I came across some big salamanders, one in the middle of the trail and the other off to the side. They weren't moving and looked like they both met their demise sometime today. The one pictured immediately below looked as if it had been run over by a bike because it's mid section was flattened. Guess, after going through all that it was still able to crawl to the side of the trail. The other salamander looked precariously close to where tires run down this rock but it wasn't flattened and by the looks of it, it seemed out of place and it wasn't kicking. With their bright yellow spots on a deep blue/gray background, the Spotted Salamander is hard to confuse with other mole salamanders. The mole salamanders are so named because most of their life is spent beneath the leaf litter and underground in burrows. Come late winter/ early spring the Spotted Sallies emerge from the ground to converge in vernal pools. Here they mate, spend a few days in the water, and leave for the woods once again. These salamanders can live for up to 10 years, if they don't get run over during their migration. They can secrete a sticky, milky substance from their skin to deter predation by mammals. After the first few warm rainy nights of late March - early April, walk along the edges of a vernal pool and you may find spermatophores and egg masses. The latter are gelatenous structures that can be transparant or milky white. In a couple weeks, the salamander larvae will wriggle out and feed upon a variety of tiny creatures in the pond. Poor bastards, probably done in by fatties. Overall, the trails were really dry, in fact this part of New England is experiencing the beginning of a very dry spring and the trails show it. Looks like the trail gnomes have been busy, too. 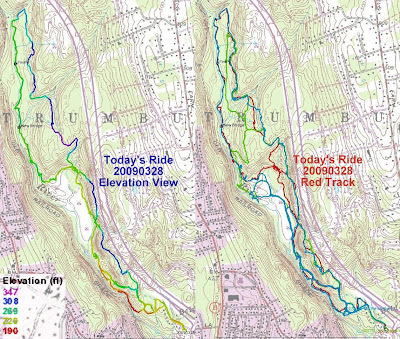 Found a new trail that was even recently raked that has a nice flowy, downhill racking quality to it that starts at the bypass trail from the Picnic Tables and runs down to the Rusty River. Even saw a fish in the Rusty River. 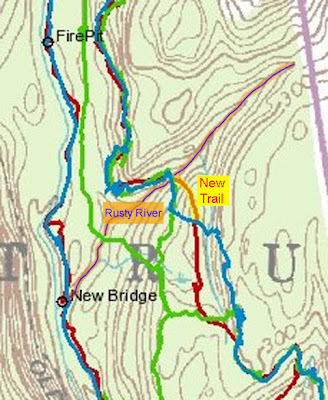 And speaking of trail gnomes there is a new trail that runs from the intersection of the two trails that go around the picnic tables down to the Rusty River. The trail has a nice flow to it and it's not as washed out as the other trail that heads down to the Rusty River but unfortunately It it will be rutted out at the end of the season unless someone comes back and does some proper maintenance. That's the problem with building trails, most people think all they have to do is clear a path and voila, you have a trail. Unfortunately, it not that easy because you really need to learn about benching and grades to properly build a trail. Noticed quite a few fire pits scattered through out the park including the one show below. Absolutely despicable. First of all fires are not allowed but then to leave all the bottles and cans is a travesty. Added to the new trails is this bridge that crosses over the Rusty River, further down stream, by the blue trail. Bad thing about it is both trees were cut from the north side of the stream bank making one side of the span thicker than the other. Over time, as these spans dry out and begin to rot, most likely they'll break either together or very close to one another. What the builders really should do is make the span with two 12' pressure treated 4x4 but then that would probably mean they have permission to do this work and doubt that is the case. Too bad because this area could use a nice foot bridge. In the distance of this shot below you can see the Trumbull Rail Trail and coming down from it is an old road that forded the river at this point and most likey connected with what is the white trail. There might also be an old road that parallels the river but I am not sure if it goes through or not. Further upstream at the foot bridge that crosses the Pequonnock there seems to be a trail that runs along the river and I wonder if these two trails ever connect. I have heard that some people night ride at Trumbull but if they are using this kind of equipment, they have to be nuts! My last loop of the ride I hooked back on the blue trail along the river. It follows precariously close to the river and is really challenging. I was feeling good and needed another loop before heading home. The proximity to the trail head meant more fire pits, too. Nice blog! When I used to live in Shelton many moons ago (live in Brooklyn NYC now) I used to night ride during winter in Trumbull. These photos bring back some old memories: slogging across that stream crossing, that crazy riverside technical trail, bombing down the abandoned rail bed, etc. I found your blog via the BSNYC blog. Thanks Mike! Yeah, I love reading Snobby's daily diatribes of the NYC cycling culture. There is very little spillage up here in the sticks. There might be a handful of fixie riders in this area.